The room is spacious and well equipped. I particularly like the provision of an in-room laundry machine. Where to find Wuhan hotels near an airport? How can I find hotels in different Wuhan neighborhoods? Where can I find hotels in Wuhan that are near tourist attractions? 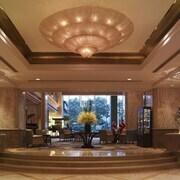 Wuhan has an extensive selection of first-rate hotel and apartment possibilities to choose from. On Expedia's handy booking pages you'll discover 103 short- and long-stay options within a 0.1-kilometre (0.06-mile) radius of central Wuhan. 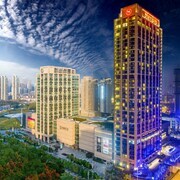 Wuhan's center is within strolling distance of hotels including Apartment Hotel Wanxide and New Beacon Xu Dong International Hotel. With 3 Expedia-listed establishments Hanyang Qu is the neighborhood with the biggest range of Wuhan accommodations. Hanyang Qu is situated 5 kilometres (3 miles) from downtown. Hanyang Qu hotels include the Royal Suites & Tower and Howard Johnson Pearl Plaza Wuhan. Thrifty travelers rejoice! Wuhan features a solid range keenly priced places to stay. 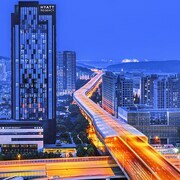 The Novotel Wuhan Xinhua is 8 kilometres (5 miles) from downtown, while the Best Western Premier Wuhan Mayflowers Hotel is 9 kilometres (6 miles) away. The Dorsett Wuhan and the Jinjiang Inn Wuhan Economic&Technological Development Zone are another two lower priced hotels that are worth checking out. 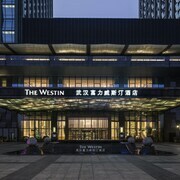 The The Westin Wuhan Wuchang is 7 kilometres (4 miles) from the heart of Wuhan. 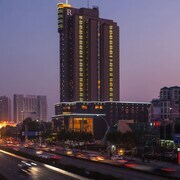 Or, alternatively, the Shangri-La Hotel, Wuhan can be found 6 kilometres (4 miles) away. Some other Expedia-listed accommodations include the Renaissance Wuhan and the Ramada Plaza Optics Valley Hotel. Looking to travel a bit further afield? South Central China offers a number of attractions. Lovers of the great outdoors will appreciate South Central China's rural landscapes, lakes and rolling hills. You should also go to a selection of the area's traditional villages, temples and craft workshops. In this part of China tourists can also try their hand at hiking and cycling. Wuchang is 6 kilometres (4 miles) to the south of Wuhan and is where you'll find Chángchūn Temple and Xilian Temple. 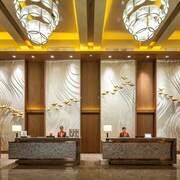 Some of our recommended Wuchang hotel options include the Maya Playa Hotel and Junyi Dynasty Hotel. 16 kilometres (10 miles) to the southeast of Wuhan, you'll also find Hongshan, home to the ibis Wuhan Optic Valley and Hyatt Regency Wuhan Optics Valley. The DangDai YiShuGuan and GuangGu ZhanShi ZhongXin are a couple of the most popular points of interest to experience when visiting Hongshan. If you are flying into or out of Tianhe International Airport and would like to stay nearby try Wuhan Tenglong Hotel or Wuhan Carton Hotel. 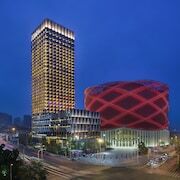 What are the most popular Wuhan hotels? Are there hotels in other cities near Wuhan? What other types of accommodations are available in Wuhan? Explore Wuhan with Expedia.ca’s Travel Guides to find the best flights, cars, holiday packages and more!